“If you abide in Me, and My words abide in you, you will ask what you desire, and it shall be done for you” (John 15:7). “And in that day you will ask Me nothing. Most assuredly, I say to you, whatever you ask the Father in My name He will give you. Until now you have asked nothing in My name. 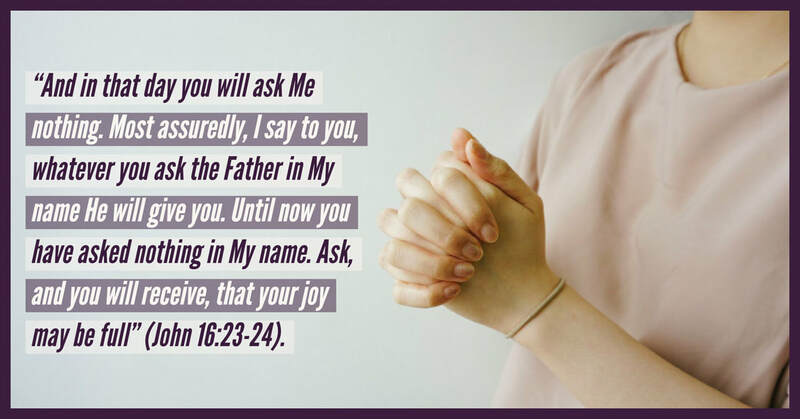 Ask, and you will receive, that your joy may be full” (John 16:23-24). “So Jesus answered and said to them, Have faith in God. For assuredly, I say to you, whoever says to this mountain, Be removed and be cast into the sea, and does not doubt in his heart, but believes that those things he says will be done, he will have whatever he says. Therefore I say to you, whatever things you ask when you pray, believe that you receive them, and you will have them” (Mark 11:22-24). “And whatever we ask we receive from Him, because we keep His commandments and do those things that are pleasing in His sight” (1 John 3:22). “The effective, fervent prayer of a righteous man avails much. Elijah was a man with a nature like ours, and he prayed earnestly that it would not rain; and it did not rain on the land for three years and six months” (James 5:16-17). “And whatever you ask in My name, that I will do, that the Father may be glorified in the Son. If you ask anything in My name, I will do it” (John 14:13-14). “Ask, and it will be given to you; seek, and you will find; knock, and it will be opened to you. For everyone who asks receives, and he who seeks finds, and to him who knocks it will be opened. Or what man is there among you who, if his son asks for bread, will give him a stone? Or if he asks for a fish, will he give him a serpent? If you then, being evil, know how to give good gifts to your children, how much more will your Father who is in heaven give good things to those who ask Him!” (Matt. 7:7-11). “Call to Me, and I will answer you, and show you great and mighty things, which you do not know” (Jer. 33:3). “Then you will call upon Me and go and pray to Me, and I will listen to you. And you will seek Me and find Me, when you search for Me with all your heart” (Jer. 29:12-13). “It shall come to pass that before they call, I will answer; and while they are still speaking, I will hear” (Isa. 65:24). “Blessed be God, who has not turned away my prayer, nor His mercy from me!” (Psalm 66:20).